Once Halloween ends, I am one eager gal to get things going for the holidays! 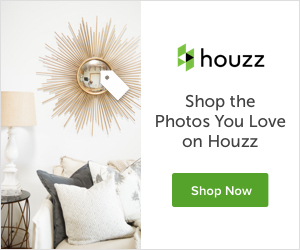 I start thinking months ahead about what color schemes I might use, the formality of my decor and how I will utilize my prior year’s decorations in new ways. Today, I am sharing a little Silver and Gold Glam Christmas Centerpiece I put together for the buffet in our dining room. For this area, I decided to use a combination of metallics so that I can pretty much do anything with my multiple table settings throughout the holiday season. We will typically entertain at least once a week during the holidays, so I wanted to keep my color palette neutral. This was a very straightforward process. First, I placed the three Christmas trees randomly on the buffet (putting the tallest one in the middle). Secondly, I wrapped the Christmas garland around the bases of the trees until it felt balanced. If you don’t have garland that work you could use Christmas picks to achieve a similar look. Next, I placed in the large handblown gold glass ornaments for contrast and then followed up by placing in the rest of the antique mercury glass ornaments (from HomeGoods). Any variety of ornaments would work here along with a different color palette that would work with rest of your decor. Finally, a few votive holders finish off the look. Super festive! Can I tell you how difficult it is to shoot photos of glass and with mirrors without photobombing the shots?! I see myself in every close-up shot in the glass ornaments, so there is no guessing who took these photos. Insert smiley face. Having the mirrors behind this centerpiece doubles the impact it has which I always have to think about. 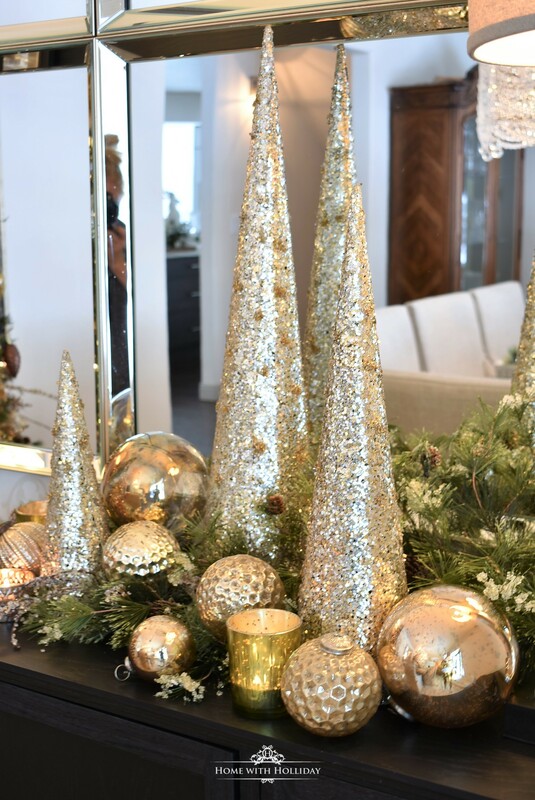 Thanks for stopping by to see this simple silver and gold glam Christmas centerpiece. There is a lot more decorating going on around here. We go home to Dallas for Thanksgiving, so I like to come back home here in Denver to a fully decorated home to enjoy for the coming month. Do you do your Christmas decorating before or after Thanksgiving?? I would love to hear from you. For lots more holiday inspirations, come join me on Pinterest! Beautiful, Holly! I noticed on IG that you may be using some blue in your decor this year? Am I right? Wow! This is so pretty! I have never done the glam gold for Christmas but this really is gorgeous! This year it’s all about the metallics and you have put this centerpiece together perfectly. I love all that shine and sparkle! Very pretty arrangement. I picked up a couple of the really large ornaments this year to mix in with my regular sized ones. Loving the look! Wow! I love all the gold, your home is gorgeous! Merry Christmas from Homeroad! After all these great ideas, I’m going to ‘revisit’ my dining room decor. thanks for the inspiration. You are so welcome, Lynn! I would love to see what you end up doing! Oh my gosh this is such a beautiful arrangement, I love the height of some of the trees and the greenery really pulls it all together. I want this on my dining room buffet. Go for it girl! Thank you so much for your kind words!! Have a great day! I love the silver and gold combo – it’s so warm and beautiful. Great inspiration!! !